"When I talk about pictures in my mind I am talking, quite specifically, about images that shimmer around the edges. 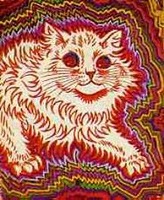 There used to be an illustration in every elementary psychology book showing a cat drawn by a patient in varying stages of schizophrenia. This cat had a shimmer around it. You could see the molecular structure breaking down at the very edges of the cat: the cat became the background and the background the cat, everything interacting, exchanging ions. People on hallucinogens describe the same perception of objects. I'm not a schizophrenic, nor do I take hallucinagens, but certain images do shimmer for me. Look hard enough, and you can’t miss the shimmer. It’s there. You can’t think too much about these pictures that shimmer. You just lie low and let them develop. You stay quiet. You don’t talk to many people and you try to keep your nervous system from shorting out and you try to locate the cat in the shimmer."